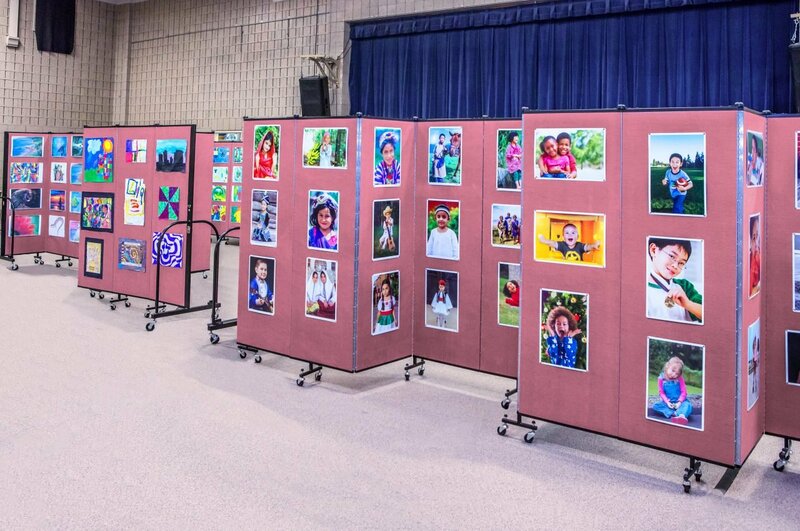 Uses: Art Display, Education Colors: Red/Mauve Lengths: 13 panel 24'-1" Heights: 6'-0"
Coordinating a school art show is a great way to showcase student artwork. Screenflex student art display walls are a fantastic and easy way to display the artwork. Students and teachers can tack the work to the panels during class. Then roll the divider into the hallway for viewing. Once the show is complete, simply roll the panels back into the classroom where the items can be removed from the panels and returned to the student. An additional option is to purchase a Screenflex Artwork Hanger that displays up to 8 pieces of artwork. The 45′′ long steel Artwork Hanger has eight pre-formed hooks stamped down the metal hanger arm that hooks over the top of any Screenflex Room Divider. Use display hangers to hang heavier items or materials not suitable for pinning. Sturdy, durable and long-lasting, Screenflex portable walls are available in 6 heights and lengths and 38 color choices. Units ship fully assembled and ready to use. Manage the space in your facility with Screenflex. Call us today at 800-553-0110 for a quote. Request a list of customers in your area at Screenflex.com.